Math and Stats Help offers free help with USask courses to all current students. The math and stats help centre offers drop-in tutoring for current U of S students. You are welcome to bring your homework and questions to Murray Library Rm. 144 to get help from our tutors. Math and stats help focus on providing help for current U of S student taking first-year and introductory courses, but can help you with a range of mathematical and statistical topics. Unfortunately, we are not able to provide help with research-level statistics at this time. Please contact the Department of Mathematics and Statistics for advice on research-level statistics. You may also find the Numeric Data library guide to be helpful. Occasionally, we offer help sessions which are sometimes geared toward a specific class, such as Math 104 or Math 110. These sessions will be listed on our Math Help Sessions page. We encourage you to check that page regularly. The Math and Stats Help Library Guide provides resources recommended by the math and stats help coordinator. The Department of Mathematics and Statistics has developed an on-line Mathematics Placement Test (MPT) for new university students. Students who are registered in most 100 level Math courses are required to write the MPT before they are allowed to register for calculus. For practice questions that will prepare you to take the MPT, use the Sample Math Placement Test from the Department of Mathematics and Statistics. If you have questions about the MPT, contact Amos Lee in the Department of Mathematics and Statistics. Looking for help with the statistical package R? The library has video tutorials available at lynda.usask.ca (NSID authentication required). Code Clinic R: Explore solutions to common R programming challenges, and then compare the results with other programming languages in the Code Clinic series. Up and Running with R: Introduces the R statistical processing language, including how to install R, read data from SPSS and spreadsheets, analyze data, and create charts and plots. R Statistics Essential Training: Use R to model statistical relationships using its graphs, calculations, tests, and other analysis tools. 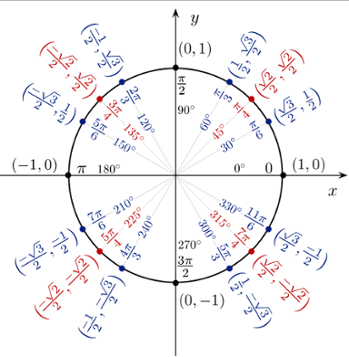 For trigonometry students: unit circle diagram showing positive angles in radians and degrees and their terminal points.